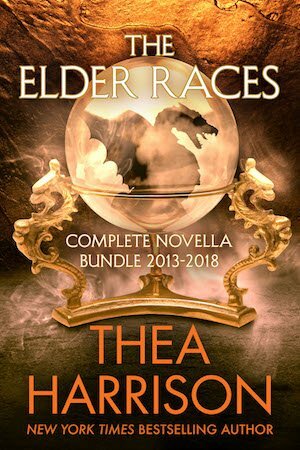 From New York Times and USA Today bestselling author Thea Harrison… comes all 13 previously published Elder Races novellas (2013-2018), in one convenient bundle. This bundle contains True Colors, Natural Evil, Devil’s Gate, Hunter’s Season, The Wicked, Dragos Takes a Holiday, Pia Saves the Day, Peanut Goes to School, Dragos Goes to Washington, Pia Does Hollywood, Liam Takes Manhattan, The Chosen, and Planet Dragos. All stories previously published separately. Warning: The novellas in this collection contain spoilers for the novels in The Elder Races series. If readers do not want to be spoiled, they should read all of the stories (novels and novellas) in the series reading order.